Wheelchair Exercise Equipment - Get Up and Get Out! Your guide to stretching and strengthening your way to independence. Millions of people just like you have gained freedom, independence and confidence by following the proven guidelines in Wheelchair Freedom! Get Help. Get Up. Get Out. get help. get up. get out! Wheelchair Freedom gives you the tools, tips and tricks you need to move to the next level of fitness no matter how long you have been in your wheelchair. No special equipment - just you and your chair! Now just add our 74 page e-book, assistance from family and friends and motivation to add more strength. vitality and independence to your life. Wheelchair life can keep you indoors, weaken muscles, change your posture and cramp breathing and digestion. Wheelchair life in short can make you sicker than you already were in the first place! Wheelchair exercise equipment coaching is at your fingertips - right here - right now. Our new 74 page e-book, Wheelchair Freedom! Get help. Get up. Get out. teaches you how to safely, easily and effectively master those wheelchair exercises needed to gain functional strength for legs, chest and back to help you get back on your feet again. Added bonus's include wheelchair safety, wheelchair accessories and how to master the difficult wheelchair to car transfer. Many people become discouraged when they are confined to a wheelchair, even if for only a short time. Often a short time is enough to slack off on life - take action now, no matter how long you've been in your chair. I've taught everything you'll discover here to hundreds of my own home care patients since 1993. "I hope you choose to dance!" How can I get out of this chair and walk again? How can I safely get in and out of my car? Discover how to get into your car from a wheelchair with improved strength! As you know, certain diseases and diagnoses are permanently and not reversible. Others, however, require only a short term "chair-cation." So, I set to work to answer both of these questions and added a lot of extra's for you too! You'll love my illustrated Wheelchair Freedom! Get help. Get up. Get out. giving you step by step instructions and pictures answering those two questions plus much more. Take the next step today - tomorrow never comes, learn what you need to do to become strong enough to walk again*, or get in and out of your car (any many extras) our ebook will get your started. When it comes to wheelchair exercise equipment, all you need is my extensive, illustrated resource, - you've got nothing to lose and everything to gain - if not the ability to walk, improved health, strength and mobility! There are only three muscles groups to focus on for strength and independence? This means that you save time focusing your stretching and strengthening on the three muscles groups that really count. It's a waste of money accessorize your manual wheelchair? This saves you even more money when you discover the big reason why! That a sidewalk curb can spell freedom and mobility? Learn how to use a sidewalk curb to your advantage and get out more often! It matters where caregivers position themselves to make car transfers a success? Find out where the best place is for a caregiver while helping patients in and out of a car. Save your back and theirs! It is possible to get walkers and wheelchairs through tight squeezes? Many patients sleep in a bed in the living room becuase they can't get through the door of their bedroom. Find out if that is permanent! Scooting your patient on a car seat or a chair only uses two simple items in your home? Back injuries among caregivers are on the rise. These two items in your home along with good body mechanics can make a world of difference! All you need is you and a wheelchair to begin strengthening today! I'll show you 3-4 levels of each stretch and each exercise for the three main muscle groups! You'll also have access to the fitness log to keep track of your progress! Simple physics can help you get that manual wheelchair into the car with ease? If you know how a see-saw works, then you'll know how to do this trick - just look at the pictures and lock your chair! optimal wheelchair safety to avoid falls, slips and oopsies. exactly what you need for a fully functioning manual wheelchair. how to fit through tight doorways with your manual chair or your walker. step by step instructions on how to transfer your patient into and out of a car or truck. step by step illustrated stretching and strengthening exercises for improved health, strength, circulation, mobility and independence. If your chair-cation has lasted longer than you thought. If you feel your life ebbing away and know you could walk again with a little motivation and know-how. If you're shut inside because it's just too hard to get in and out of the car. Think twice - this e-book is loaded with all the information that I successfully taught my patients over the years! If they can reach their goals, you can too! Your purchase is totally risk free to try! Nothing to lose, yet health, strength, vitality, mobility and greater independene to gain!. You have instant access to your purchase! You could be planning your home program or your next outing today! You get instant access to Wheelchair Freedom! in under 5 minutes through a safe and secure transaction. Right after your order is approved (usually in seconds), you will be directed to a page with download instructions. It's that easy. Best of all, you don't have to wait for days or even weeks until the mailman brings your package. 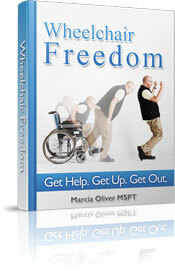 Download your copy of Wheelchair Freedom! now, and begin your journey to improved health and independence. Wheelchair Freedom! is a PDF file that you read immediately on your computer. Or you can print a hard copy and read it anywhere, even in bed. Once payment has been received, you will be directed to our download page. Here you will be given instructions and password to download your Adobe Acrobat e-Book. It may take up to 30 seconds before you are asked to enter your password. You can also click on a seperate link to download your Fitness Log. And - visit us often!